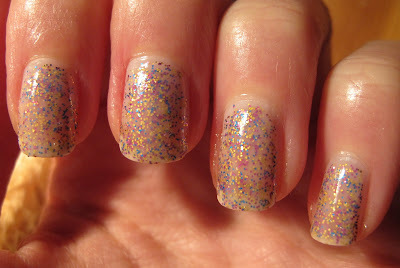 Never Enough Nails: OPI Jelly and Glitter Sangwich! I don't know who started doing Jelly Sandwich manicures, but they've been quite popular among the nail blogging community lately. In case you've never seen one, a Jelly Sandwich involves layering a jelly polish underneath and on top of a glitter (or even crackle) polish, essentially making a sandwich! This is the first sandwich I've attempted and I'm sad to say my pictures do not do it justice. It was thunder storming all morning today and the sky is darker than it usually is at 8 p.m. I always photograph in natural light, and there really wasn't any to be found. Only this picture above shows the real beauty of this manicure. WOW! Look at that awesomeness! For this look, I actually used two different jellies for the base and top, I got a bit confused LOL. I used OPI In The Spotlight Pink as the base, but then remembered it was really too clear to use for this purpose. Then I layered on two coats of OPI Sparkle-icious for the meat of the sandwich. Finally, I topped this sandwich with one coat of OPI Step Right Up! I like how this came out a LOT! 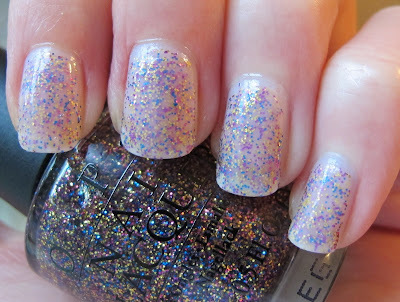 The cool thing about these manis is that the glitter looks kind of captured inside a pool of polish or something. Make sure you click on these pictures to enlarge them and see the detail. I now want to purchase the three jellies from OPI Texas so that I can do many many more jelly sandwiches! What do you think of the jelly sandwich look? Have you tried one? Do you have a favorite combination? OPI In The Spotlight Pink and Step Right Up! were sent to me for review by a PR agent for OPI. For more information, please see my Disclosure Policy. They're definitely addicting! I just want to do more of them! I love this combination! Magical! Your 'sammich' looks great!!! Love your choices. Thanks Lesley! It kind keeps reminding me of a birthday party or something! Like frosting with glitter in it, maybe. Thanks Kimberly! Have you tried one of these? They're pretty fun! PolishSis- thanks, it does remind me of DL Glitter in the Air! Jenna- I'm dying to do more, but I have to get more jellies! I never liked them until I tried the sandwich!